Railroad Welding Products North America has over 200,000 miles of track that must be maintained on a daily basis. Wear from the constant pounding of rail cars and locomotives on frogs and switches is a never ending problem. In 2013, Postle Industries turned its attention to welding applications in the railroad industry related to hard surfacing and buildup of rail and track components. 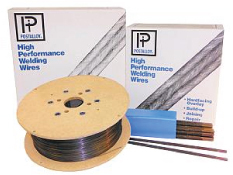 Two new products were introduced – Postalloy® Frogtuff and Railtuff, available as both flux-cored wire and flux-coated electrodes. Postle Introduces More Advanced Hardbanding Products For over 40 years, Postle Industries, Inc. has been designing alloys and procedures for many industries including: mining, farming, agriculture, recycling and construction to name a few. With the successful history of Postalloy® Hardfacing Products, it was only natural for Postle Industries to become involved in the complex wear of drill pipe, heavyweight, drill collars and casing/risers. Our Research & Development department has work tirelessly to address the wear and casing concerns of the drilling industry, and as a result, Tuffband® NC was introduced in 2002. As drilling increased throughout the world, a need for a more wear resistant product became apparent due to the severe drilling conditions encountered in the oil and gas fields. Postle addressed this necessity with the development of Duraband® NC, which is designed specifically for these severe wear applications.